"I am having trouble getting this cam out again," came the call from my climbing partner somewhere mid pitch, about 75 feet below. Out of habit, I eyed my watch, then looked toward the dark patch of sky that was steadily moving our way. "Try to rotate the shaft to loosen it, then wiggle it out just below where it is now," I replied, knowing exactly which cam they were likely referring to—a #2.5 Helium cam placed in a pod in a finger crack. Several tense minutes followed before I heard a "Got it!" I felt the rope begin to move through my belay device again. While I felt like the placement was reasonable, I began to notice a trend, and I couldn't help but wonder if this would have happened with my tried-and-trusted Black Diamond Camalots. Being the very first spring-loaded camming device (SLCD) back in 1978, Wild Country's Friends will forever hold an important place in the history of clean climbing. Over the years many imitations developed, and some felt the newer SLCDs surpassed the original Friend. Not to be left behind, Wild Country completed a full redesign of their signature SLCD and now offers the Helium Friend. Upon receiving these highly anticipated cams, I was a bit surprised to see the remarkable resemblance to the Camalot, which I think few will argue, is North America's go-to camming device. With its oval thumb loop and handlebar mustache trigger, the Helium Friend looks nearly identical to a Camalot. The replaceable cables that retract the lobes are also near mirror images of the cables on their main competitor. 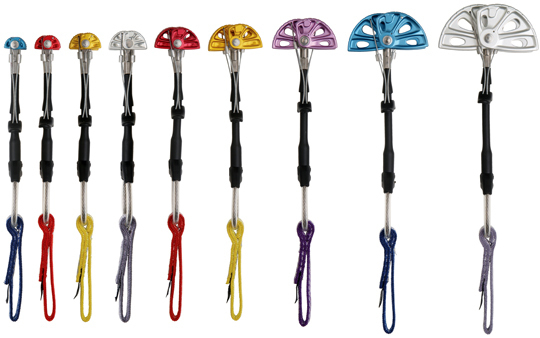 And like other modern cams, the Helium's sewn 12mm Dyneema runners are color-coded. From the anodized aluminum lobes to the molded plastic and the sewn runner, the craftsmanship of these units is evident. The full set of Helium Friends, from .55 to 4.01 inches. These Friends share many design features with other top-shelf cams on the market, like BD's uber-popular C4 Camalots, but stand out with their light weight and single-axel design. 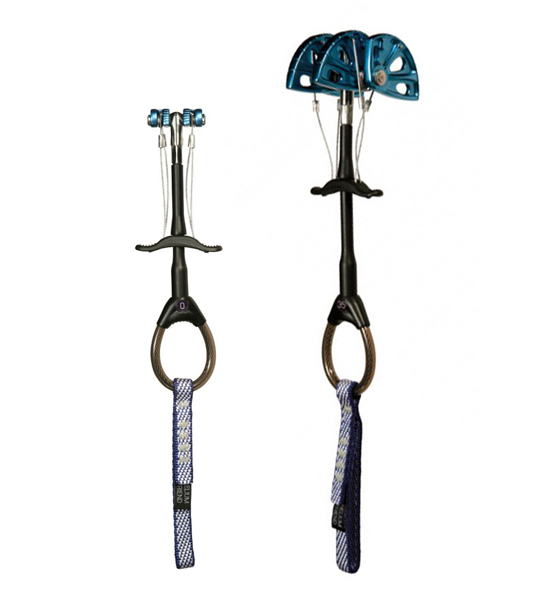 Over the years, both my eyes and fingers have become acutely calibrated to the sizing of the Camalot, thus, when it came time to head to Red Rock for a guided trip using the Helium Friends, I wondered how I would keep from fumbling at length though the rack before finding the size I needed. Since the color-coding of the Heliums was different from the Camalots', I thought I would measure them against their closest Camalot cousin and hang them from a color-coded 'biner to acclimatize to the new sizes. It was here that I noticed a single rack (about .6 inches to 3.5 inches) requires an extra Helium Friend to cover this same range as Camalots do—seven cams verses six cams. This is due to a slightly smaller range per cam that I expect stems from the Helium's single-axle design, as opposed to the Camalot's two axles. It should be noted that Wild Country has actually decreased the number of cams necessary in the Helium line. The older style Friends used 11 cams to cover the same range as the Helium cams now cover with nine cams. The design has improved in that aspect, but it still falls short of the Camalots' range. Helium Friends sizes 00 and 3.5. The Friends' long stems allow for deep placements, but the trigger's position closer to the lobes of the larger sizes inhibits easy extraction. Our reviewer says he frequently had to use a nut tool to hook the buried trigger while cleaning it from deep cracks. I have spent the last year and a half plugging the Heliums into cracks throughout the Western US, including the North Cascades, Smith Rocks, Red Rock, Lover's Leap, Yosemite and a few other areas. While they have a design common among high-quality cams, they were a bit trickier to place and to clean. Perhaps one of the reasons for this is the Helium Friends' extra stem length and trigger location compared to most other cams. The Helium's stem is significantly longer in length than other cams, which can be really helpful for deeper placements, but the trigger on the larger sizes is too close to the lobes so it can get more easily buried in the crack if it walks. These large cams are definitely the trickiest to clean on rope drag-prone routes and in cracks that require deeper placements. This was the cause of a few mid-pitch delays as a partner or I needed a nut tool to reach the trigger that had walked out of reach. Finally, addressing the elephant in the room, with a name like Helium cams, they had better be light and they are. According to Wild Country, they're 6 percent lighter than previous versions and, by my own measurements, more than 10 percent lighter than the nearest match in a Camalot. The combination of longer shaft and slightly smaller range makes these a touch more finicky to place and clean than the Camalot. In all, Wild Country's redesigned Friends have injected themselves right back into the running for best camming devices available today. Pros: High-quality construction; color-coded Dyneema runners; longer shaft allows deeper placements; extremely lightweight. Cons: Smaller range than other cams due to single axle; longer shaft allows deeper placements, but can be harder to clean as trigger goes deeper as well.